If you couldn’t make it to INTEROP Las Vegas to see our ZFS + SSD caching product demo, don’t fret! We’re sharing all of the details here, too, so that no one feels left out. 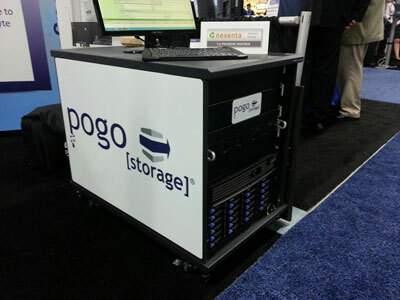 Pogo has pioneered the integration of Open Storage and flash technologies into our solutions from the beginning, and our new ZFS-based StorageDirector Nexenta™ appliance (configured with sTec® s800 Series and ZeusRAM SAS SSDs) is no exception. Nearly 10,000 people — primarily IT managers and directors, and network admins — attended INTEROP this year. We performed speed test demos hourly at our booth, so that as many of those 10,000 as possible could experience the awesomeness of this system, up close and personal. These demos showcased the performance benefits of sTec’s SAS SSDs on the ZFS storage platform, providing a cost-effective way to get high-peak IOPS using SSD caching. With these capabilities, this is the perfect appliance for hosted services, e-commerce, government, higher education, multi-media, and other ‘big data, fast insight’-driven industries. 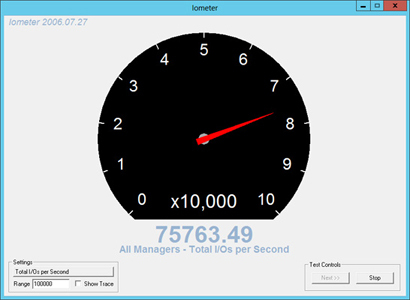 Using the Iometer disk benchmark test, the demo highlighted the system’s ability to hit high IOPS within large-capacity ZFS storage environments. The results? 75,000+ peak random read IOPS and up to 530 MB/s throughput for peak sequential reads. With IT managers facing big data, cloud, and virtualization challenges, a ZFS storage system with SSD caching could significantly change the storage performance and economics for a SMB or mid-sized organization. Our StorageDirector Nexenta SAN products combine the value of ZFS on an Open Storage platform with caching from sTec SAS SSD’s, to provide an alternative to all-flash legacy storage solutions. SSD caching provides a lower cost-per-user and cost-per-transaction, enabling IT departments to address I/O-intensive applications (enterprise database, or cloud applications and services) , without breaking the bank on proprietary legacy storage technologies. This entry was posted in Storage Solutions and tagged Flash Storage, government, nexenta, ssd, ssd caching, sTec, StorageDirector. Bookmark the permalink.